Whats Really Going to Happen to Silver in 2011 – 2012 – Way WAY Up? Understandably with Silver exploding these last few weeks, there’s been much public interest in what’s really going to happen in 2011 – 2012 to Silver, and otherwise. Even before the Crash JP Morgan campaign got properly going we’ve had $60 Silver predictions and various scenarios of Silver between $90-$714 Oz so this fantastic piece by Rob Kirby gives a little more insight into the skullduggery in the Derivates markets, and why JP Morgan might not be the only players getting crashed as Silver heads off up into the clouds.. When researching the precious metals, often times things are seldom as they appear on the surface. GATA Secretary and Treasurer – Chris Powell – has said that the true picture of a nations’ gold holdings are, “more closely guarded than their nuclear secrets”. This has been more-or-less proven true based on the Federal Reserve’s reaction to GATA’s 2009 FOIA request for information concerning GOLD SWAPS. The Fed is ON RECORD admitting they’ve done gold swaps – which, by definition, necessarily utilize sovereign American gold stocks. To date, the Federal Reserve has stonewalled GATA’s FOIA request citing their ‘privileged status’ and reluctance to divulge ‘trade secrets’. GATA has maintained that the Federal Reserve / U.S. Treasury in conjunction with other Central Banks have for years been suppressing the price of gold [and silver too] – in efforts to mitigate and to cover up their own debasement of fiat currencies. Historically, when Central Banks or governments print more and more fiat money, precious metals prices RISE. The money printing is not only inflationary but when done to excess it can undermine confidence in faith based fiat currency regimes. Precious metal has no counterparty risk and cannot be printed – which is why it “is” and always will be money. Remember folks, gold is money, as evidenced by EVERY Central Bank in the world listing gold bullion on their balance sheet as an official reserve asset. GATA has identified and documented that Central Banks utilize precious metals derivatives, and in particular swaps, as a primary method by with Central Banks rig metal prices. In the presence of EXTREME money printing, it’s understandable why Central Banks and governments would want to suppress the price of gold [and silver] and be less than transparent about their nefarious activity in this regard. Knowledge and detail regarding these activities could undermine a nations’ currency, their credit rating and thus their ability to service their sovereign debt. 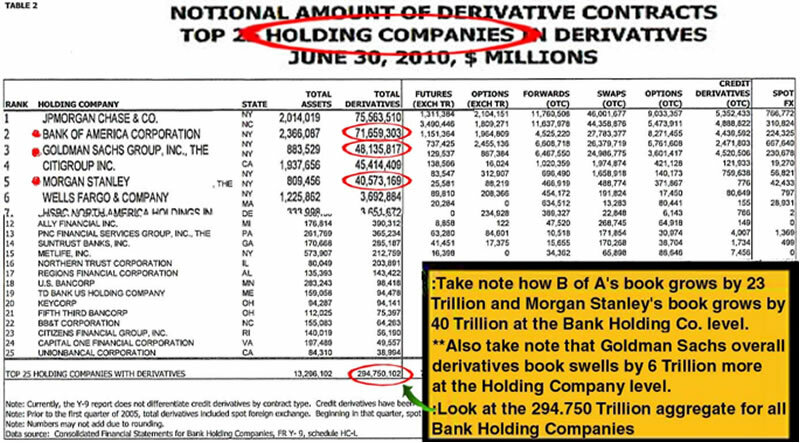 The following data set is taken from the June, 2010 Bank for International Settlements [BIS], Semiannual OTC Derivatives Report and it is compared to other data from the U.S. Office of the Comptroller of the Currency’s, June, 2010 Quarterly Report on Bank Derivatives Activities. Relative comparison along with analysis within the data sets sheds new light on the scope of the precious metals price management scheme. Additional analysis is presented regarding the number and identities of other possible [or likely] players. It also illustrates how paper derivatives have become tools to determine/rig price instead of the intended and stated purpose of price discovery of the underlying physical asset. Question: There are a total of 417 Billion notional in Gold derivatives outstanding – AND THE GOLD / SILVER Price RATIO is 49:1 – then WHY are outstanding notional silver derivatives 127 Billion???? These BIS numbers suggest that the proper gold / silver ratio should be roughly 3.3:1 or silver priced TODAY at 1,400 / 3.3 = 424.00 per ounce. OCC data tells us that J.P. Morgan and HSBC constitute 13.5 billion worth of the BIS’s reported total of 127 billion of derivatives in “other precious metals”. That’s about ONE TENTH of the total. WHAT ABOUT THE OTHER 90 % ?????? This implies a silver price of 1,400 / 9.7 = 144.00 per ounce of silver. Coincidentally, or perhaps not, COMEX open interest in gold futures is roughly 600K contracts @ 100 oz. per contract that is roughly 60 million oz of gold open interest. COMEX open interest in silver futures happens to be about 135k contracts @ 5,000 oz per contract which is roughly 650 million oz of silver open interest [note that silver open interest is not quite 11 times the open interest of gold]. So, again I ask, why is the gold / silver ratio at 48: 1????? ***For those who are not aware, silver naturally occurs in the earth’s crust approximately 7 – 10 times more frequently than gold. Take note and remember that the breakout provided – above – by the OCC was for Commercial Banks ONLY. The BIS tells us that total global outstanding “other precious metals” derivatives are 127 billion. Yet, the U.S. OCC tells us that J.P. Morgan and HSBC combined – make up 13.577 billion of the 127 billion BIS total [roughly 10 %]. 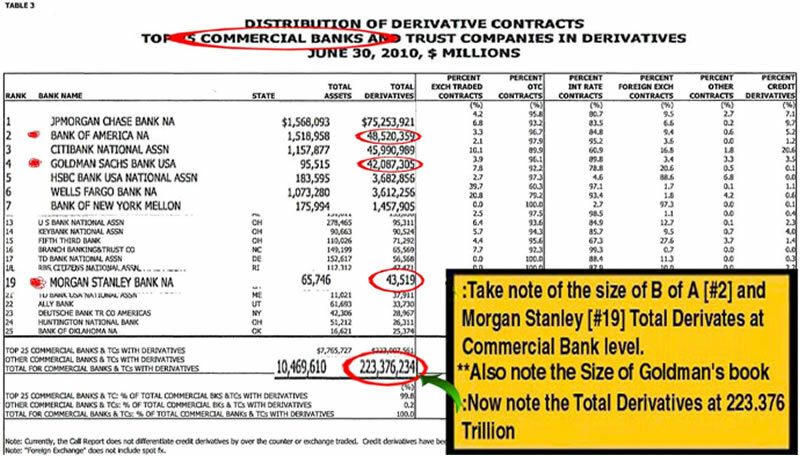 The U.S. OCC tells us that Morgan Stanley and B of A and Goldman have an additional combined 70 TRILLION in derivatives – at the Bank Holding Company level – but they give us NO HINT as to what portion of these totals consist of precious metals activity. We are left to assume that this is because the OCC is only mandated to regulate Commercial Banks – while Bank Holding Companies fall under the purview of the Federal Reserve. Unless J.P. Morgan and HSBC are LYING to regulators as to the extent of their silver market activity – there are other MASSIVE players in the silver price suppression game. Who ever these ‘players’ are – metaphorically, they MUST BE BLEEDING FROM EVERY ORIFICE with silver’s parabolic run up in price over the past few months. Most likely among American entities are MORGAN STANLEY, B of A and Goldman Sachs – since together they are operating a 70 Trillion derivative “BLACK BOX” about which we know LITTLE to NOTHING as it pertains to precious metals. Any way you slice it – precious metals data reporting on the part of American regulators is atrocious. Simple MATHEMATICS tells us a gold / silver ratio at 48:1 is EXTREMELY contrived and REEKS of manipulation on the part of the Federal Reserve and the Banks they are charged with regulating. Got physical precious metal yet? Evil Speculators & Hedge Funds Planning to Corner the Gold Market? Next post: The “Inevitable” Return to the Gold Standard?